La Bassine Birth Pools are very easily transportable, quick and easy to set up and move around prior to filling. La Bassine Birth Pools are a cocoon shape with an inflated base and sides. The built in vertical I beams gives an incomparable strength to the wall, while also acting as a fail-safe mechanism in the event of an accidental puncture. La Bassine Birth Pools are strong enough to sit on quite safely which make them practical and comfortable for the midwife to reach you with two internal handles to assist you in changing positions and to hold onto while you breath your baby down. The external dimensions of La Bassine Birth Pools are 165cm x 135cm. 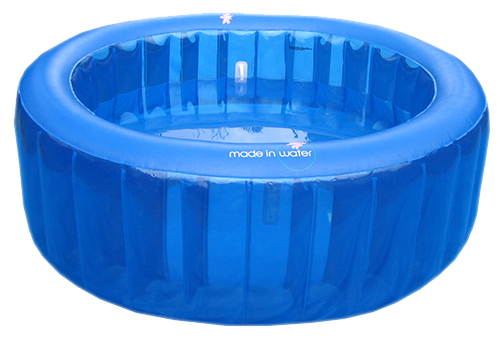 Their internal dimension is 125cm x 95cm x 65cm deep and holds around 450 litres at 80% full. La Bassine Birth Pools are manufactured using a highly durable vinyl (0.42mm thick) that does not contain any phthalates, lead or cadmium so often used in plastic production. Keep it for up to 5 weeks! We cannot predict whether baby will be early or late and it is okay to wait for him or her to be ready to be born. No rush. We typically recommend arranging for delivery by 37 weeks and you get to keep it until 42 weeks. Some babies just need more time. Please call us or sms/whatsapp to +65 9012 0071 to reserve your Birth Pool in advance. Or, email us at info@parentlink.com.sg. Please call us or sms/whatsapp to +65 9012 0071 to reserve your Birth Stool in advance. Or, email us at info@parentlink.com.sg. Please call us or sms/whatsapp to +65 9012 0071 to reserve your Oxygen Tank in advance. Or, email us at info@parentlink.com.sg.